A father's intimate look at his daughter's developing mind from birth to age three. Unlike any other time in our lives, we remember almost nothing from our first three years. As infants, not only are we like the proverbial blank slate, but our memories are like Teflon: nothing sticks. In this beautifully written memoir of his daughter's first three years, Charles Fernyhough combines his vivid observations with a synthesis of developmental theory, re-creating what that time, lost to the memory of adults, is like from a child's perspective. 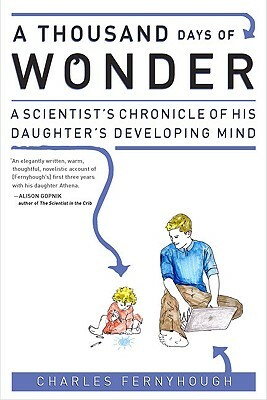 In A Thousand Days of Wonder, Fernyhough, a psychologist and novelist, attempts to get inside his daughter Athena's head as she acquires all the faculties that make us human, including social skills, language, morality, and a sense of self. Written with a father's tenderness and a novelist's empathy and style, this unique book taps into a parent's wonder at the processes of psychological development. Funny, touching, and fascinating, A Thousand Days of Wonder will reveal the extraordinary journey into personhood that children make during the momentous first three years of life.